The first time I made scallion oil, I set the stove on fire. Having little knowledge of oil fire and water at a young age, I quickly threw water into the sauce pan. The flames immediately flared up and violently engulfed the stove. Luckily, dad was nearby and smothered the flames with a wet bath towel. If he wasn’t there, I probably would have thrown more water into the oil fire. Parents, teach your children about the effect of oil fire and water. They will thank you. Now I only make scallion oil in the microwave. Stove-top method: Heat vegetable oil in a small sauce pan. 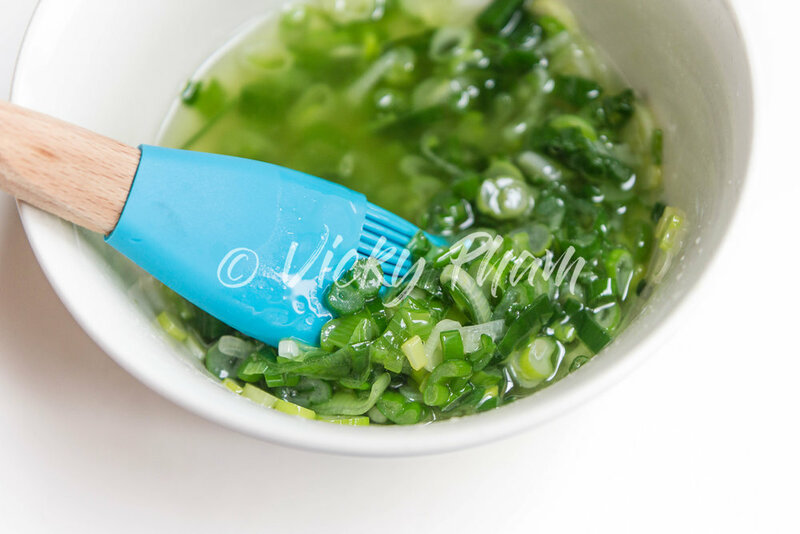 Place sliced scallions in a heat-proof bowl. Pour hot oil over scallions. Be careful of oil splatter. Mix in salt and sugar. Microwave method: Combine sliced scallions, oil, salt and sugar in a microwave-safe bowl. Heat on high for one minute. Slather scallion oil with a brush over grilled meats, vegetables and seafood.